2.14.2012 — With gas prices on the rise, Centralina Clean Fuels Coalition / Centralina Council of Governments, ROUSH CleanTech, and Ferrellgas say there is no time like the present for fleets to begin fueling their on-road vehicles with propane autogas, an alternative fuel that is affordable and reliable. The four organizations hosted a luncheon at ROUSH Fenway Racing in North Carolina to share the benefits of converting to vehicles running on this clean burning fuel with fleet managers. Phil Horlock, president and CEO of Blue Bird, talks about the increased power and fuel efficiency of the company’s most recent alt-fuel product release. Competitive Lawn Service, Inc. comes by the ROUSH factory to pick up their brand-new ROUSH CleanTech liquid propane autogas powered Ford F-350. Jesse and Hilary Triick from Pristine Green explain why they decided to switch all of their lawn equipment to run on clean and reliable propane autogas! Jim Coker of Metro Lawn & Heritage Propane describes the benefits that lawn care providers will see by switching both their equipment and vehicle from gasoline to propane! Ken Brooks from Super Shuttle describes his company’s new green push, and why they decided to switch to propane autogas! Fueling a ROUSH CleanTech liquid propane autogas powered vehicle is not really any more difficult than fueling a gasoline or disel powered vehicle…just watch! One of the key benefits of the ROUSH CleanTech liquid propane autogas fuel system is that vehicle operation and performance is virtually transparent as compared to that of the base gasoline vehicle. One of the reasons for this is the fact that there is no loss in engine performance. 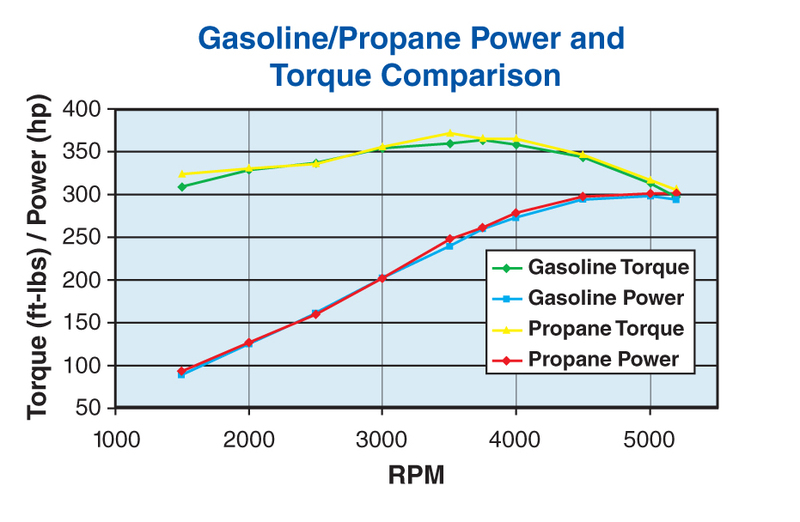 The following graph shows the engine performance comparison of the Ford 5.4L 3V gasoline engine as used in the 2010 Model Year Ford F-250 / Ford F-350 vehicle both before and after the ROUSH CleanTech fuel system conversion. Propane as an automotive fuel (propane autogas) has a high-octane value and has key properties for spark-ignited internal combustion engines. Propane autogas carries an almost 100-year heritage, with the first propane-based vehicle developed in 1913. Propane autogas, which has propane as its primary constituent, has the advantages of producing lower emissions, offering more energy per unit mass while having a higher octane rating than gasoline. In addition, through the use of propane autogas we can continue to work away from dependence on foreign sources of domestic energy. Propane autogas also has the advantage of already having a robust national infrastructure in place to support its implementation not only as an alternative fuel, but also as a primary fuel.